Multi channel TRION™ signal conditioning modules provide analog-digital conversion on each channel and are user exhangeable. Use TRION™ modules with each measurement system of the DEWE2 series. Simultaneous sampling TRION™ signal conditioner modules are the heart and soul of the DEWE2 series of data acquisition systems. TRION™ modules combine the power of simultaneous sampling and 24 bit ADC technology with advanced DEWETRON signal conditioning – plug one convenient module right into your DEWE2 platform. TRION™ modules provide the TIMING BACKBONE for recording many disparate data sources in perfect sync with each other. TRION™ modules are available for a wide variety of analog inputs, as well as digital I/O lines, synchronous counter/encoders, and timing and SYNC interfaces. Additionally, TRION™ modules are available for CAN-bus interfacing. Choose your TRION™ module(s), plug them into your DEWE2 instrument, turn the system on and get to work! TRION™ cards are automatically identified and configured within the software as soon as it is launched. What is a Strain Gage (also referred to as Strain Gauge) and why do you need a strain gage signal conditioner? Strain gauges are often used in devices for measuring acceleration, pressure, tension, and force in the manufacturing, process control and research industries. However, strain gages have also been connected to the human eye retina, insects, plastics and concrete – any material that is under investigation for strain. In most instances the electrical signal is converted from the strain cannot be used in its raw form due to incomplete bridges in the strain gage, inconsistent voltage to the power bridge and output that is extremely small (less than 10 mV/V). This is where strain gage signal conditioners come into play. Common conditioning includes: bridge completion, bridge excitation, excitation sensing, signal amplification, offset nulling, shunt calibration and linearization. DEWETRON’s TRION™ signal conditioning module for strain gage sensors delivers separate analog to digital conversion on each channel, simultaneous sampling for analog (204.8 kS/s per channel), 24 bit resolution with anti aliasing filters. 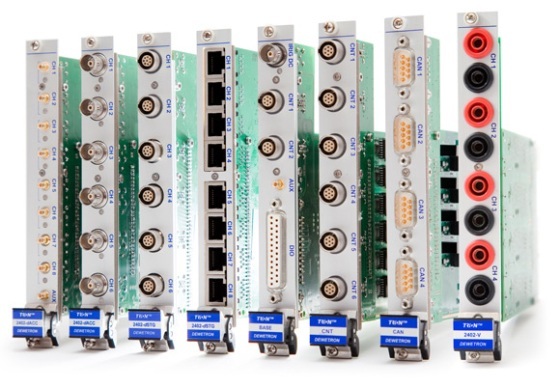 Our modules are available with up to 8 input channels and a variety of input connectors : RJ-45, DSUB-9, and LEMO. 4-wire full bridge with constant current excitation (piezoresistive bridge sensors) are supported.